Twenty-five area restaurants closed due to health concerns. CINCINNATI — The future looks bright for Sharonville’s largest convention hotel. The past was a bit gritty. “As a result of heavy roach infestation, fruit fly infestation and rodent infestation the facility has agreed to voluntarily close,” Hamilton County inspectors wrote last May after visiting The Grille at Northern Lights in the lobby of Ramada Plaza on Chester Road. The Grille is now closed as the hotel’s owners, LDI Hospitality Management, embark on a $10 million renovation that will convert the 230-room property into Ohio’s first Delta Hotels by Marriott. The company declined to comment on the violations. Assistant Hamilton County Health Commissioner Greg Kesterman said inspectors didn’t push for additional sanctions because the hotel was responsive to their concerns. Ramada Plaza had two of the 25 local restaurants that closed in 2018 after health inspectors discovered food-safety problems. Roaches were the main culprit in nine of those cases. Plumbing problems were cited in six closures, rodents in five. Eight of the closures lasted a day or less, while eight lasted five days or more. WCPO has been tracking restaurant violations on a regional basis for six years with a searchable database that is the only way to find restaurant violations from six local counties at once. This year’s database includes 30,713 violations from nearly 6,282 food-license holders, which includes restaurants, grocery stores, corporate kitchens and food trucks. These dining establishments averaged 4.9 violations in 2018, up from 4.5 in 2017. Click here to open WCPO's Dirty Dining Guide in a new window. In prior years, we’ve focused on the restaurants that had the most violations in the prior calendar year. But violation counts don’t necessarily tell you which restaurants had the most serious problems. The Grille at Northern Lights, for example, had only six violations in 2018. But one of them involved a live mouse. Local health departments vary on their approach to restaurant closures. The Northern Kentucky Health Department, for example, requires a food establishment to cease operations immediately if it receives a score below 60 out of 100 on an inspection. Generally health departments only require closures when inspectors think public health is in danger. Northern Kentucky had nine restaurant closures last year. Warren County had none. Middletown had one. Cincinnati had five. Hamilton County required 10 restaurants to “voluntarily close” in 2018 and placed 22 others into administrative process that includes more frequent inspections and requirements for employee training. Hamilton County closed the Grand Buffet restaurant at 6421 Glenway Ave. on Sept. 24 after an inspector found rat droppings throughout the facility and a “live rat in a cage in the back room.” The closure lasted one day, as inspectors documented no violations in a Sept. 25 follow-up visit. But records show the county threatened “immediate closure and additional enforcement action” on Dec. 7, when an inspector found rat feces in a storage area. No violations were documented in Grand Buffet’s most recent inspection, Dec. 10. Manager Tom Chen said his family-owned restaurant pays a lot of attention to food safety and did everything it could to rid the building of pests. He thinks the rat that inspectors found in September came from a vacant retail space next to his restaurant. He stressed that the rodent and droppings were found in a room that had no food - only pots, pans and other equipment. At Popeyes Louisiana Kitchen in Eastgate, the problem was a leaky roof, which caused ceiling tiles to fall into the dining area and kitchen. The restaurant had a roofing company on site when a inspector returned the next day, averting a closure. Three days later, however, the leaks continued and an employee told an inspector “when it rains the chicken prep table shocks them.” On Nov. 6, Clermont County Health Commissioner Julianne Nesbit visited the restaurant. The department declared it a “clear and present danger to public health.” The restaurant voluntarily closed for three days. The leaky roof improved but drips continued into December, when Clermont County’s Board of Health scheduled a hearing to consider a license suspension or revocation. That hearing was delayed at the request of the restaurant’s manager. A “continuing active roof leak” was again documented Dec. 20. On Jan. 9, the board “issued orders to repair/build over/replace roof and provide proof of work completed prior to Feb. 13,” wrote Maalini Vajayan, Clermont County’s director of environmental health, in email response to WCPO’s questions. Popeyes' parent company released a statement indicating a new roof is on the way. The reasons for closures in Northern Kentucky included low inspection scores, infestations of rodents and roaches and backed-up sewage. The health department closed Matsuya Japanese Restaurant in Florence from April 3 through April 6. 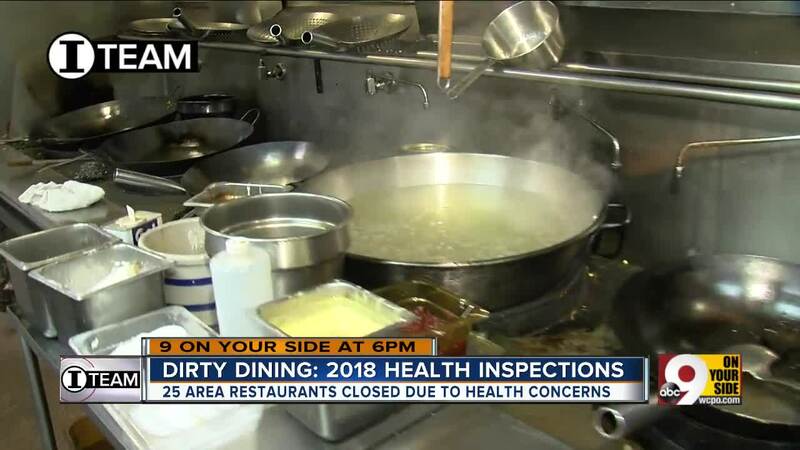 The restaurant received an inspection score of 58 out of 100 with points deducted for several serious violations, including food stored at improper temperatures and rodent droppings in a cabinet below a sink and on the floor in the servers’ station area. Owner Hidecki Matsushita said the rodent droppings were remnants of a problem the restaurant resolved several years ago. Matsushita said he corrected the problems quickly with the help of an exterminator, noting that his restaurant has been around for more than 20 years. Matsuya Japanese Restaurant scored a 92 out of 100 during its follow-up inspection on April 6 when the inspector allowed it to reopen. Owner Yu Q. Chi said the discovery of roaches surprised him because he has been paying hundreds of dollars each month to avoid such problems. Chi said he brought a pest control company in to apply extra treatments, which solved the problem quickly. Records show the health department allowed him to reopen the restaurant on Oct. 2 after a follow-up inspection resulted in a near-perfect score of 98 out of 100. “We take care of the problem,” Chi said. Roaches resulted in a number of restaurant closures in Cincinnati, too. The Cincinnati Health Department found roach activity at the Penn Station franchise at 654 Main St. on Dec. 6. The restaurant reopened Dec. 18. The Sports Page restaurant at 636 Vine Street closed for nearly a month starting Nov. 14 after Cincinnati inspectors discovered rats were entering the building from a nearby alley. Owner Kali Paskal said it was the first time in the company’s 42-year history that it had a rat problem. He sealed the exterior and eliminated all food sources. The rats haven’t returned since he re-opened Dec. 10. Back in Sharonville, operators of Ramada Plaza have the confidence of city officials who credit Montu Bedi and his family with reviving a once dormant property across the street from its 25-year-old convention center.